Sellars and Yeatman could hardly have done better. I love the assertion that early cinema is otherwise known as the cinema of attractions. How true that has become. CheatHouse.com, and other sites like it, are heavily dependent on essays being submitted by students themselves, who gain greater access to the site the more essays they have accepted, making the whole process becomes a self-fulfilling disaster. There are some sites where hard-up academics contribute essays for a few cents, but most of these sites are sustained by the students’ work themselves. All offer a sample paragraph or summary; all charge either through subscription or pay-as-you go. The history of the great talent Lillian Gish is immeasurable. She has acted in more productions per decade then anyone else in this century. She has been in one hundred and five films alone, that’s not counting all the on stage productions she has performed in. The amazing talents of this once beautiful young actress can be seen in any of her early silent films too. Way Down East and Orphans of the Storm are two of her earlier films that portray her exquisite skills. Yet none of this would be know if it wasn’t for a mastermind of directing, D.W. Griffith. Gish would have lived a long unrecognized life of theatre and missed out on the most important part of her career, the silent film. Cecil B. DeMille is both celebrated and derided for his overall depiction of the “new woman,” a development resulting from the rise of consumer culture in the late nineteenth century. In this increasingly commodity-driven society, women increasingly moved into the public sphere in search of freedom and discovery at the risk of their own reputations and their families’ social position. This is notably brought out in DeMille’s most famous film “The Cheat,” in which the female protagonist disrupts the established order and inverts the traditional notion of womanhood. 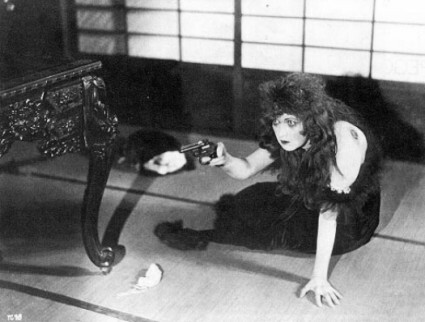 DeMille uses the notion of the “new woman” in “The Cheat” to critique society during that time. The essays on more respectable sites such as BookRags are promoted as reference guides, of course, not as encouragements to plagiarism, and naturally they can be used as such. What I find interesting is the muddle and cliché in most of the model essays, which reflect what a peculiar world early film must present to the average student of the twenty-first century. How to make sense of this mad, mute, monochrome world, and to find in it relevance to the films and concerns of today? It’s a wonder that any can. It is an awful practice, and the blatant invitation to cheat from some of these sites (even using the word in their names) is shocking. But I have a certain nostalgic sympathy for the students floundering with concepts and a past that lie beyond their comprehension – well, the comprehension of some of them at any rate. It’s contemptible but let’s hope the plagiarizing students only go on to careers in academic film theory, where they can’t really hurt anyone. Heaven help us if they’re aiming at careers in science, engineering, or medicine, and they acquire their knowledge of those subjects in the same fashion. Whether well written or not, I can hardly imagine papers like these foiling an even remotely knowledgeable professor– it seems as though all possible sources archived on this subject would be too familiar to my film prof for me to even think about falsifying. And ridiculous as the essays may seen (and I could only pick out the examples I could get for free, of course), plagiarism is rampant in education, and policing tools to track texts which have been taken from online sources are in constant use – see http://www.submit.ac.uk, for example.